I’ve managed to complete an electronic Halloween project in time for Halloween. It’s simply called Halloween Blinky Eyes. I wanted to use LEDs to make glowing “eyes”, which would peer out from the shadows around our house, as if creatures were lurking, watching the trick-or-treaters who approached. But actually wiring up and soldering a bunch LEDs, let alone making them fade in and out and blink, was going to be time consuming, and I don’t really have a dedicated workspace for that right now. But, being a programmer, I am accustomed to thinking of shortcuts which might take a lot of up-front effort in order to save time in the long run. 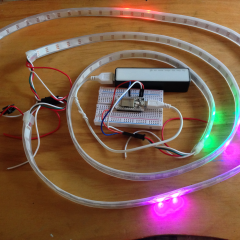 In this case, I thought of using addressable LED strips, and programming a microcontroller to animate pairs of “eyes” along the strip. This saves me 99% of the wiring effort, and pretty much turns my laptop into my workbench for most of the work. This entry was posted in Personal and tagged arduino, blinkenlights, blinkyeyes, core, eyes, Halloween, neopixels, particle, photon, projects, ws2812. Bookmark the permalink.